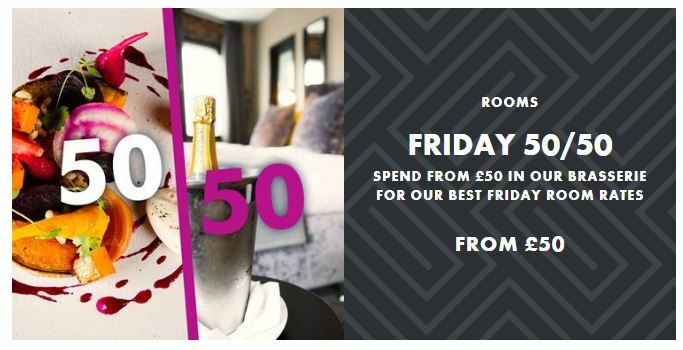 This week we are shouting out about the fantastic 50/50 offer at Malmaison. Spend £50 at dinner on food and drink in the brasserie and receive the room from just £50* per night. Based on standard room bookings. Advance bookings are essential. Excludes, breakfast, lunch, and items ordered in advance for the room. Rate can be canceled up to 4 pm day prior to arrival without penalty. Remeber Malmaison offer 6% on all valid bookings. If you want to promote this offer, please get in touch with the team at affiliates@eqtr.com with your campaign suggestions. Room must be taken on the same evening as the £50 food and drink is spent. If your spend in the brasserie is less than £50, the difference in cost will be added to your room rate e.g if you spend only £25, a £25 addition will be made to your room rate, making the room rate £75. Not to be used in conjunction with any other offer. Offer is subject to availability. Supplements apply for superior rooms and upgrades.